Under the patronage of His Excellency Mr. Saad Hariri, Lebanon hosted the Telecom Review Summit On Friday March 29, at the Phoenicia Hotel in Beirut. 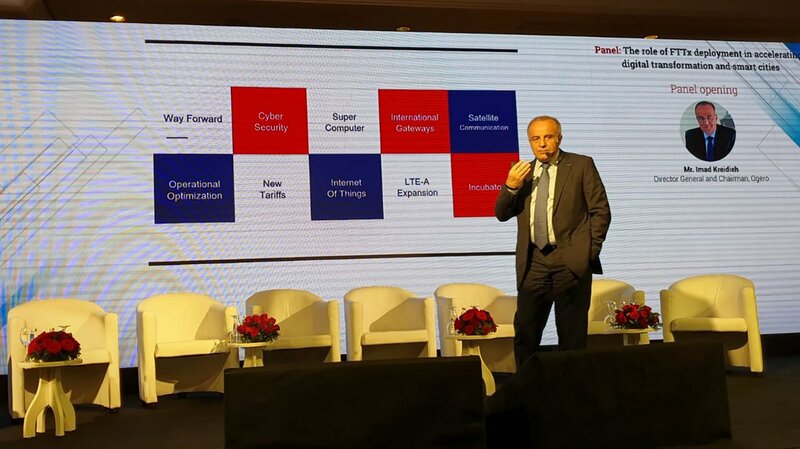 The Summit itself started off as a modest gathering within Lebanon, but has now grown into a large multinational congregation of big Telecom influencers, leaders, and stakeholders. Ogero participated in this event as the Telecom Review’s Strategic Partner for this Summit. Ogero’s very own Chairman Mr. Imad Kreidieh was also attending as a Panelist covering the role of FTTx fiber in Digital Transformation and Smart Cities. Mr. Kreidieh has attended previous Telecom Review Summits around the world, and has expressed great pride in its Lebanese edition, as he notes a significant momentum in its evolution and how Lebanon’s growth in the Telecom context placed it back on the Telecom Review’s radar, thus indicating a positive precedent to Lebanon’s future involvement in ICT and Telecom on the international level. Ogero is proud of its role in this Summit as well as its Chairman’s role and involvement. We hope this growth and representation remains on the rise as Lebanon continues to strive towards placing itself on the global market map.